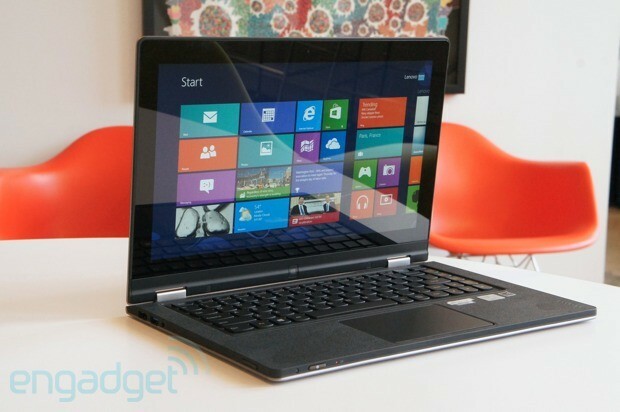 The Yoga 13's shape-shifting design makes it the most intriguing Windows 8 convertible we've seen. It's not perfect, but it's still a good choice among Ultrabooks. How would you rate the IdeaPad Yoga 13-inch? 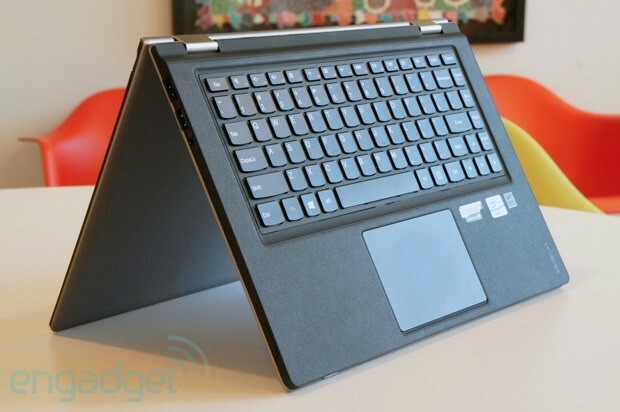 The Yoga 13 looks like a slightly lower-end version of Lenovo's other Ultrabooks. At first glance -- i.e., before you start playing around with its foldable display -- the Yoga 13 looks like a slightly lower-end version of Lenovo's other Ultrabooks. Like the models that came before it, this has a book-inspired silhouette, with subtle scooping along the edges that's meant to evoke pages stuffed between two covers. Whereas the IdeaPad U300s Ultrabook is made of unibody aluminum, though, the Yoga 13 is coated in softer materials, including a rubbery lid and leathery palm rest. The final result isn't premium, per se, but the entire machine feels well-made nonetheless -- you won't notice any flex in the palm rest, or any other part of the system, for that matter. And besides, if the build materials seem ho-hum, we can at least assure you of this -- the entire machine, from the lid to the palm rest to the display, is impervious to scratches. After more than a week of testing the Yoga 13 and regularly tossing it in a bag with other items, it is still in pristine condition. Once you handle the machine for a few minutes, it's impossible not to notice how thin it is. 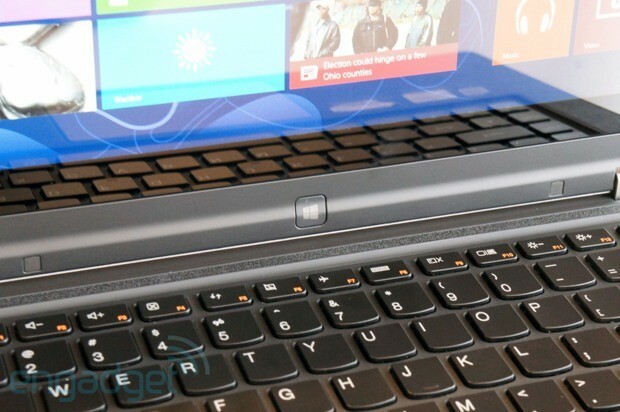 We hear an awful lot about how touchscreens add to a laptop's weight, and we've used that as an excuse to explain why the Toshiba Satellite U925t and other Windows 8 convertibles feel a bit chunky. And yet, even with a capacitive touchscreen on board, the Yoga 13 measures just 0.67 inch thick, weighing in at 3.3 pounds. It looks thinner than competing notebooks, and it is. 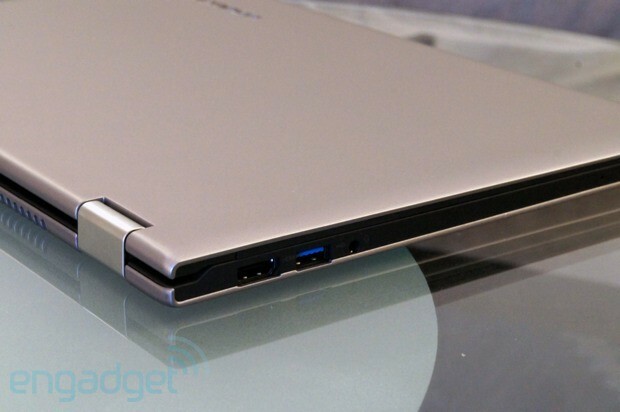 Interestingly, Lenovo retooled the power port for the sake of keeping the machine as thin as possible. What we have here, tucked on the right edge of the laptop, is a proprietary, rectangular power socket that looks kind of like a small USB port. (It's yellow on the inside, instead of blue, so you'll never actually mistake it for a USB 3.0 socket.) A proprietary adapter is a little annoying, we suppose, but it should only really be an issue for people who are upgrading from an older Lenovo system. For everyone else, this thin design should be well-worth the trade-off. Continuing our tour around the device, there are two USB ports (one 3.0, one 2.0), an HDMI socket, a volume rocker, a button for locking the screen orientation and a 3.5mm headphone jack. There's also an SD card reader -- clearly, Lenovo learned its lesson after leaving it off last year's U300s. We've been testing several Windows 8 convertibles lately, and this is clearly the most interesting take we've seen yet. Now for our favorite part, that thing that makes the Yoga, well, the Yoga: that awesomely flexible hinge. If we sound excited, it's because we've been testing several Windows 8 convertibles lately, and this is clearly the most interesting take we've seen yet. It's not just that the screen plays a neat parlor trick, folding all the way back into tablet mode. It's that the hinge feels so reassuringly sturdy -- firmly attached, but not stiff like the slider on the Toshiba Satellite U925t. Conveniently, the physical keyboard turns off once you push the display back far enough. You'll know it's been disabled because you'll see a touchscreen keyboard appear on-screen, letting you know you're officially in tablet mode. That said, there's something disconcerting about using the Yoga 13 in tablet mode: the keyboard remains exposed on the back side. True, the keyboard's disabled at that point, but it still feels odd to cradle the device in landscape mode, and to feel your fingers pressing against loose, flappy keys on the other side. For what it's worth, Lenovo is selling a $40 sleeve that can cover just the keyboard when you're using the device in tablet mode. It's a bit of a bummer that you have to buy this extra accessory to make the flappy keys go away, but at least you can use the sleeve as a proper case -- it's roomy enough that you can fit the entire laptop inside. In addition to that obvious tablet mode, though, you can fold the Yoga into a couple other poses. One is "tent mode," with the screen folded back, and the system standing upside down, with the hinge in the air. We don't imagine this is any more useful for movie-watching than simply using the Yoga as a plain old notebook. It does seem, though, that it could come in handy for presentations, especially if you'd rather use your fingers to control the action onscreen. If you like, you can also fold the keyboard back so that it's flat against your desk, with the display sticking straight up. That serves about the same purpose as tent mode. It's just not as comfy as some of Lenovo's other keyboards. As any Lenovo diehard will remind you, the keyboards on the company's IdeaPad laptops aren't quite the same as the ones you'll find on its ThinkPads, but they generally have a lot in common: the same U-shaped "smile" keys, with springy feedback and a generous amount of travel (see: the ThinkPad X1 Carbon and IdeaPad U310). That said, this doesn't feel like Lenovo's best work. Even after more than a week of use, we still found that the keyboard didn't register all of our presses -- fairly often, we had to hit the Backspace key and re-type whatever letter it was we meant to hit. Speaking of the Backspace button, it's awfully small, and can be hard to find with your finger if you're touch typing. Other major keys have been shrunken, too, including Enter, Caps Lock and Tab. It's a workable layout, for sure, and it's still better than what you'll find on most other Ultrabooks. It's just not as comfy a setup as some of Lenovo's other keyboards. In case you were wondering, the keyboard isn't backlit, which was true of last year's U300s as well. That's a little atypical for a notebook as expensive as this, but it doesn't really detract from the machine's usability, either. In case you couldn't tell, we're more concerned about the key travel and the size of the buttons. The Yoga 13 has a large glass trackpad that supports all the Windows 8 gestures you'd make on the touchscreen -- swiping in from the right to expose the Charms Bar, et cetera. For the most part this works well, though we did struggle a bit when it came to swiping in from the top of the trackpad to expose menu settings, and open tabs in IE 10. Additionally, classic multi-touch gestures like pinch-to-zoom and two-finger scrolling both work smoothly. Still, we ran into some trouble with single-finger navigation: often, the cursor would stop short on the screen before we arrived at whatever it was we meant to click. On the bright side, the trackpad's built-in button is easy to press, and makes but a quiet sound. The beauty of having lots of Windows 8 review units lying around is that it's easy for us to compare all of those touchscreens side by side. Even amid so much competition, the Yoga 13 comes out looking pretty good. The 1,600 x 900, 300-nit IPS panel looks noticeably crisper next to more pedestrian 1,366 x 768 displays, though it's still not as stunning as the 1080p panels used on the XPS 12 and Acer Aspire S7. Then again, those two machines each have a higher starting price, so is anyone really surprised they come standard with nicer screens? Pixel count aside (and we do think 1,600 x 900 will be good enough for many people), the viewing angles are as broad as you'd expect on an IPS display: you shouldn't have any trouble working with the machine in your lap, or sharing the screen with a friend while you watch Netflix. We also found the touchscreen to be responsive -- it was generally quick to register our various taps and swipes. As we often say about ultraportable laptops, the audio quality is on the tinny side, but that distortion actually seems more subtle here. Sure, bass-heavy music won't sound quite the way the artists intended, but it's at least pleasant to listen to, which we can't say about every thin-and-light laptop that crosses our desks. Of the three configurations sold on Lenovo's site, we tested the middle one, with a 1.7GHz Core i5-3317U processor, the same one used in many other Windows 8 convertibles. It also had 4GB of RAM and a 128GB SSD. If benchmarks are any indication, the Yoga 13 mostly performs on the same level as other Windows 8 Ultrabooks with similar specs. As with other Windows 8 notebooks, too, start-up time is less than 10 seconds (six seconds to the log-in screen, according to our stopwatch). Any difference in our PCMark and 3DMark scores is negligible, though SSD read speeds (as measured by ATTO) were nearly half what we recorded on the Toshiba Satellite U925t and Dell XPS 12. When it comes to battery life, at least, we've been having something of an unlucky streak with Windows 8 convertibles. The Dell XPS 12 lasted five and half hours in our standard rundown test, while the Toshiba Satellite U925t crapped out 20 minutes sooner. The Acer Aspire S7 (not a convertible, but a touchscreen laptop) delivers absolutely abysmal runtime -- it managed just four hours and 18 minutes in the same test. The Yoga 13 falls into the same ballpark: it lasted through five hours and 32 minutes of video playback, with WiFi on and the brightness fixed at 50 percent. As you can see, that's better than all those other Win 8 machines we mentioned, but that's not saying much -- not when non-touch Ultrabooks can last six or even seven hours on a charge. The Yoga 13's battery life isn't bad, considering the category it's in, but we're holding out hope that the next generation of these devices offer better endurance, touchscreens be damned. Though Lenovo is guilty of including some bloatware on the Yoga 13, it's not nearly as heavy a load as you'll find on other Windows 8 machines, like the Toshiba U925t. One app, Lenovo Transition, is actually quite useful: it lets you decide which apps will automatically run at full-screen when you enter tablet-mode. There's a bunch of pre-sets and, as you'd expect, they're all programs you can use without a keyboard. These include Windows Media Center, PowerPoint and MS Paint, among others. To be clear, too, you can set different actions for different programs, meaning you could choose to just have Windows Media Player run at full-screen if that's what you wanted. Besides Lenovo Transition, you'll find tiles for Lenovo Support, Skype, Microsoft Office, Intel's AppUp store and Lenovo Cloud Storage, powered by SugarSync. Metro, er, Windows 8 apps include eBay, Evernote and the music streaming service, Rara.com. On the security front, Lenovo included a trial for McAfee Security Advisor. Like most other consumer PCs, the Yoga 13 comes with one year of parts-and-labor coverage. 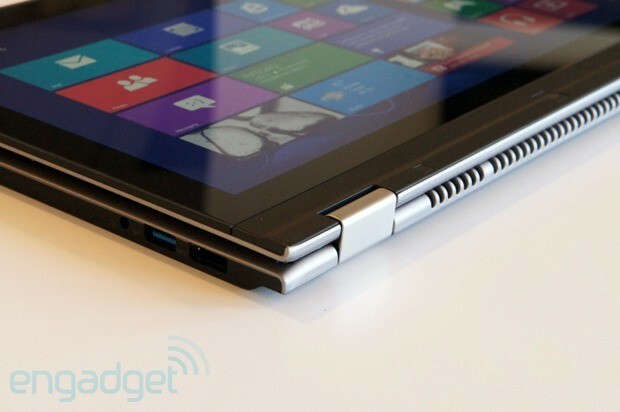 We haven't seen another Windows 8 convertible with quite this versatile a design. Though the Yoga 13 has a list price of $1,110 and up, it's currently starting at $1,000 on Lenovo's own site. That's the Core i3 model, which also has 4GB of RAM and a 128GB SSD. Each of the three main configs has 128GB of storage, in fact, except one has a Core i5 processor (that's $1,100) and the other packs a Core i7 chip (that goes for $1,300). The i5 and i7 versions also have eight gigs of RAM -- double what's offered in the base i3 model. All come with Intel HD 4000 integrated graphics. From what we can tell, there's no 256GB storage option for sale on Lenovo.com, so hopefully you can make do with 128 gigs. There's also an 11-inch Yoga coming, though it has an ARM chip and runs Windows RT, not Windows 8. In other words, it's a completely different class of product than the Yoga 13, even if it does have the same form factor. So far, we've been heavily comparing the Yoga 13 to the Toshiba Satellite U925t and the Dell XPS 12, and for good reason: both are similarly sized Ultrabooks that can be used in tablet mode. As flawed as the Yoga 13 is, we still think it's a better bet than the U925t, which offers even shorter battery life, and whose slider design makes for a compromised typing experience. It also has a lower-resolution display, despite the fact that it costs more. 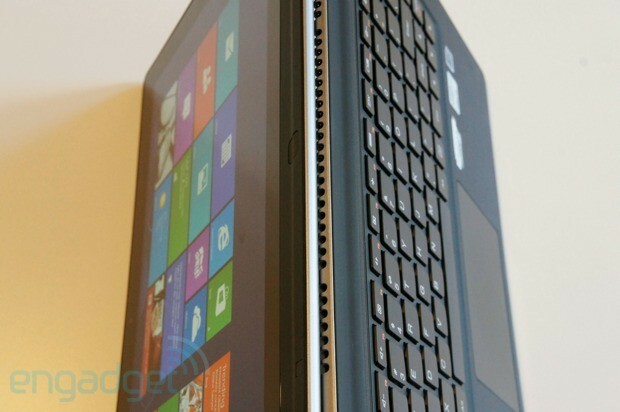 It's in the Dell XPS 12 that the Yoga 13 finds some stiffer competition. Though it's more expensive (the base model costs $1,200), it has a more pixel-dense 1080p display, as well as a comfortable backlit keyboard. We'll admit, though, the XPS 12's rotating, pop-out screen is not nearly as satisfying to use as the bendy hinge on the Yoga 13. Depending on your preferences, too, you might miss the ability to fold the machine into all the poses the Yoga is capable of. Still, as we said, when it comes to tablet mode, at least, the XPS 12 is more comfortable to use, since the keyboard is tucked away. As for performance, the two machines are mostly well-matched in battery life and overall speeds, though the XPS 12's SSD offers considerably faster read rates. The Yoga 13 is also likely to draw comparisons with the dual-screen ASUS TAICHI, though we confess we haven't had the chance to play with one for more than a few minutes. The 13-inch version, which goes on sale next month for $1,300 and up, is pricey even for a Windows 8 convertible. Then again, no one ever said a machine with two 1080p displays would be cheap. Back in January, when we first saw the Lenovo IdeaPad Yoga at CES, we declared it to be one of the most memorable things to come out of the show. That was 10 months ago, though, and thanks to that gap, there's a bit of a discrepancy between our initial impressions and our reaction following a week of real-world use. As we've discovered, it's an imperfect product, with a flaky trackpad, relatively limited storage and a fairly mediocre typing experience (this is usually Lenovo's strong suit). What's more, without the optional sleeve to cover the keyboard, the Yoga is awkward to use in tablet mode, since your fingers press up against the exposed buttons. Still, the Yoga remains an intriguing specimen; we haven't seen another Windows 8 convertible with quite this versatile a design. And what a great design it is: as much as we complain about the keyboard, the hinge is sturdy and well-engineered. The entire package feels thin and light, despite the fact that touchscreens usually add heft. Even if you rarely flip the screen around, this is a solid Ultrabook in its own right. Sure, there are other Windows 8 PCs with sharper screens and even faster SSDs, but those cost about $200 more. Compared to the competition, then, this is still a good option. Left alone in its price class, it's an even stronger choice. 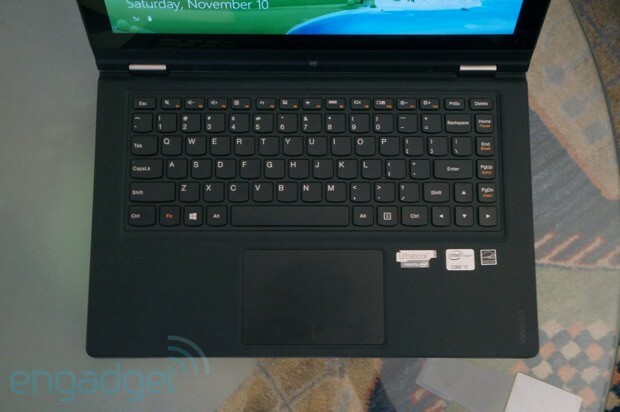 Let's just hope Lenovo can quickly update that flaky trackpad. That's not too much to ask, right?